Habitat: Open country, esp. overlooking rivers, lakes, or seacoasts; open forests and wetlands; prefers area with nearby cliffs or rock outcrops for nesting. Also nests on bridges and tall building in cities. Diet: Birds, including waterfowl, shorebirds, gulls, pigeons, songbirds, as well as many others. Also eats bats. Occasionally, other small mammals and fish. 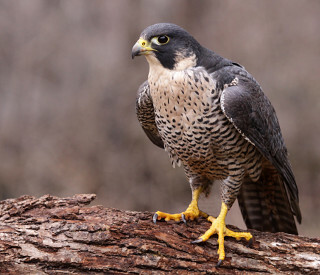 The peregrine falcons we see in New England breed mostly in northern Canada and Alaska as well as other areas north of there. They are known to breed locally in the contiguous United States, including in some locations in New England. In the 1960's, peregrine falcons were no longer breeding successfully in New England due to the negative effects of DDT and other chemicals. After DDT was banned in the 1970's, these raptors were reintroduced. 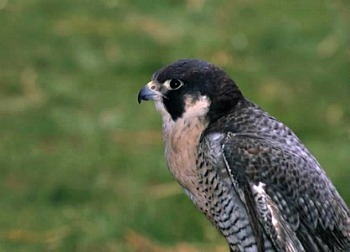 After the gradual growth of their population, peregrines are now found at many of their original breeding sites.